Exchange-Traded Funds in Europe provides a single point of reference on a diverse set of regional ETF markets, illuminating the roles ETFs can play in risk mitigation and speculation. Combining empirical data with models and case studies, the authors use diffusion models and panel/country-specific regressions—as well as graphical and descriptive analyses— to show how ETFs are more than conventional, passive investments. 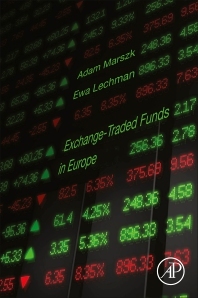 With new insights on how ETFs can improve market efficiency and how investors can benefit when using them as investment tools, this book reveals the complexity of the world’s second largest ETF market and the ways that ETFs are transforming it. 5. Exchange-traded funds and financial systems of European countries: growth factor or threat to stability? Adam Marszk, Ph.D., Assistant Professor at the Faculty of Management and Economics, Gdansk University of Technology (Poland). He completed all exams in the Chartered Financial Analyst (CFA) Program ran by the CFA Institute. Author and reviewer of many publications in local and international journals focusing on following topics: financial innovations, linkages between financial markets and economy, financial systems in underdeveloped economies, economic integration, portfolio management. Coordinator and investigator in research projects financed by national and international institutions. Winner of the 2015 Jan Uphagen’s Award for the Best Young Scientists. Ewa Lechman, Ph.D. Habil, is an Associate Professor of Economics at the Faculty of Management and Economics, Gdansk University of Technology. Her extensive research interests concentrate on economic development, ICT, and its role in reshaping social and economic systems and various aspects of poverty and economics in developing countries. She was the 2013 winner of an Emerald Literati Network Award for Excellence and is a member of the editorial boards of international journals on technology diffusion, the digital economy and economic development. She coordinates and participates in international research and educational projects and also works as an independent expert assisting with innovation assignments, including the evaluation of small and medium enterprise proposals, EU-financed programmes, and policy design regarding innovativeness, digitalization, education and social exclusion.